This is a greatly UNDERValued and UNDERrated date and grade. 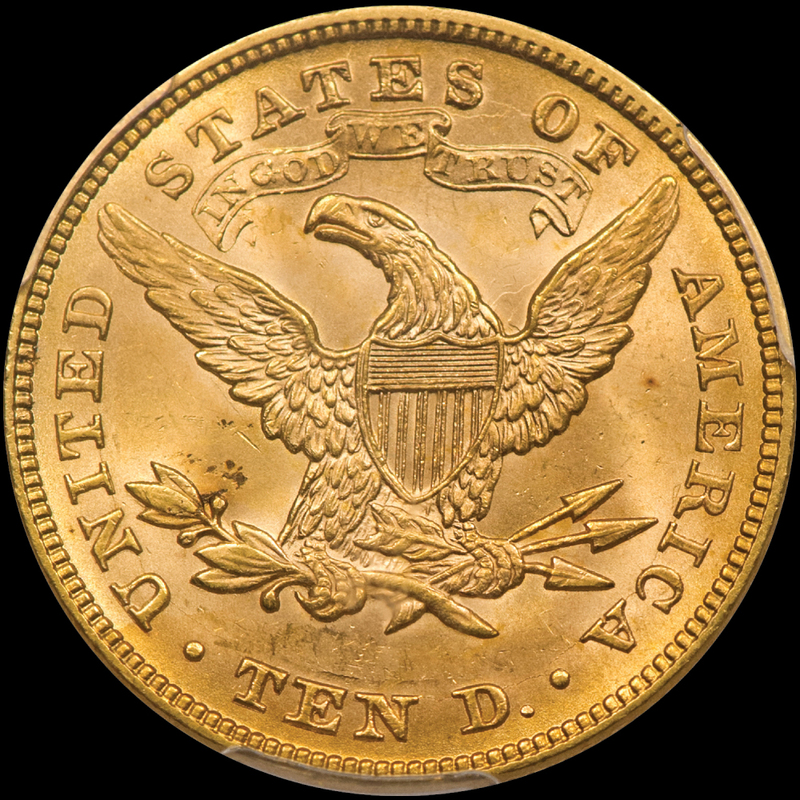 There are NO 1880 $10 graded finer at PCGS ! Only a small scuff on the left obverse and one on the back is what we can see that keeps this coin from a full MS65 designation. Overall, the coin is pretty clean and smooth. A glowing luster is serious better then you see on most pre 1900 $10. Both sides are an original gold color with a neat slightly thick band framing the rims. There are NO real spots (there are some toning dots on the back) or discolorations. Miss Liberty and the details are frosty an are crisply struck up. The eye appeal is super nice! PCGS 19, NGC 11, CAC 8. PCGS has graded a total of 4 1880 P’s MS64+. 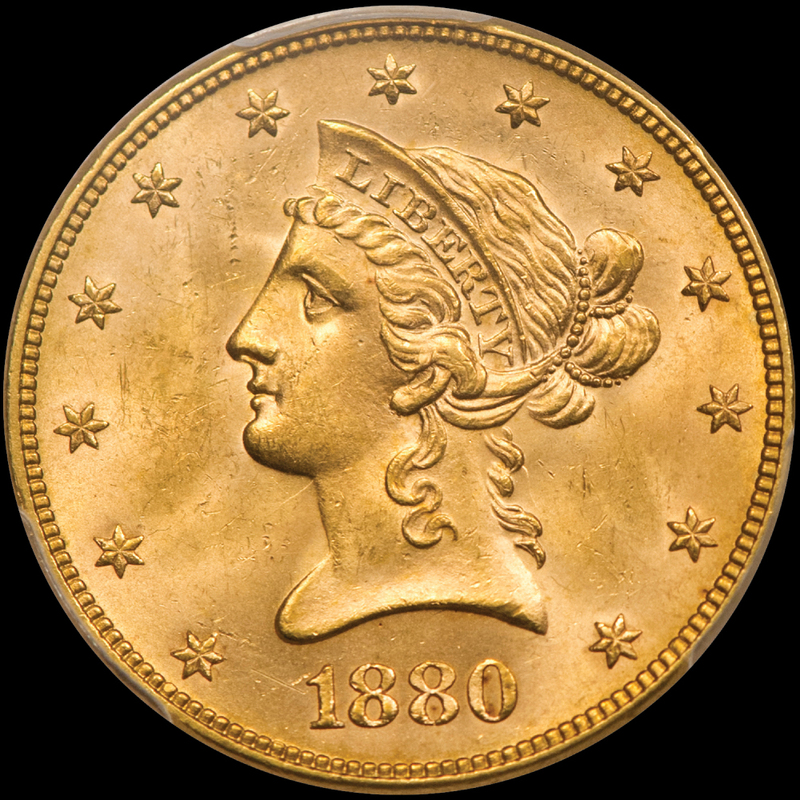 We bought this coin from our 10/2017 Regency Sale for $7,767.00. The current Collectors Universe Value is $9,500.00. The last regular PCGS MS64 (NO +) sold for $12,925.00 in 03./2103. This certainly a date and grade we never see. It is a POWERFUL statement that after 35+ years of operations, PCGS has graded only one higher-and MS65+ Opportunity knocks loud here!